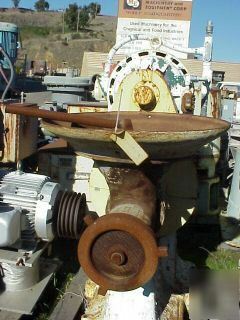 Meat extruder, enterprise, with 8" diameter feed screw and die. (2) sets of dies available - (1) 1/16" diameter and (1) 1/4" diameter. Machine has a type a feed screw. Serial no. 46956 and machine no. 1266. Extruder is driven by 30 hp motor and roller chain drive. Feed screw has 32" diameter feed hopper mounted above.